3d Oregon is excited to announce that we will be holding supplemental tryouts for our Summer 2019 Select Teams. Tryouts will be held on February 1st and 8th for boys graduation years 2027-2024 and February 2nd and 9th for boys graduation years 2023 – 2020. Players are encouraged to come out for training with 3d Lacrosse and immerse themselves in a unique teaching and learning experience. The summer season runs from May 2019 to July 2019. Information about the schedule for the season, including practice times/location and tournaments will be posted under Boys Summer Program. For the Summer season, practices are held on weekdays. If you ask college coaches at any level, they will all agree: Player development and team training is the most important aspect of a youth or scholastic lacrosse player’s experience, however this tends to be the least emphasized component of club lacrosse nationwide. 3d Lacrosse consistently produces structured training camp scenarios that foster learning and rapid player development that will undoubtedly help a player achieve a higher level of overall performance. The tempo of a 3d Lacrosse training session and the tactics being used will produce nothing short of a Division I lacrosse practice environment. 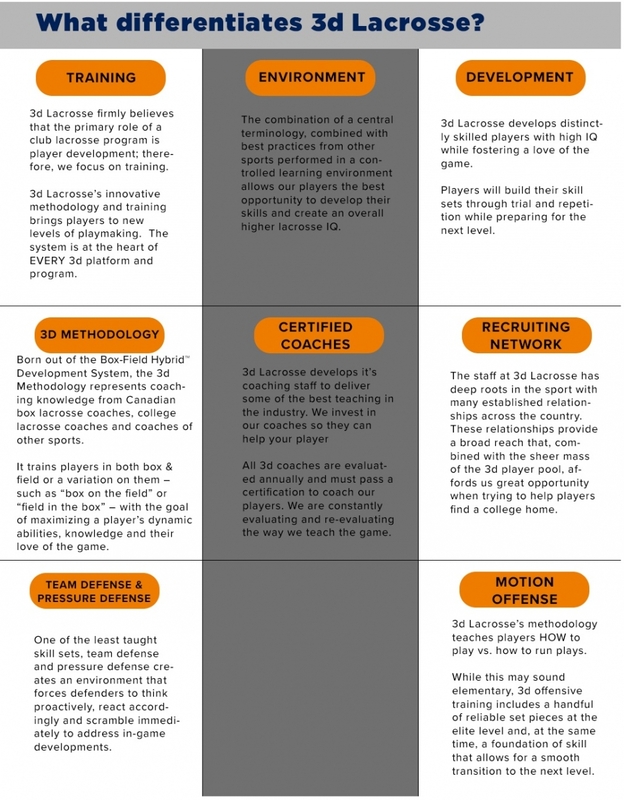 Players training with 3d Lacrosse will learn X's and O's and skills from some of the country’s most experienced lacrosse coaches who have been trained in the 3d Methodology and bring a wealth of lacrosse knowledge from a wide variety of backgrounds in the sport. Given the opportunity to learn from outstanding coaches and train in a cutting-edge development system, the 3d Oregon tryouts should be an invaluable experience for all who attend.